Wanting to be the best small scale farmer from Taung, is Johannes Ntsimane’s five year plan. This patient, honest and hardworking man has made farming his life and believes that if you do things the right way you can go far in life. I am from Taung in the North West Province and I currently farm on 10 ha of land which is a shared pivot of 20 ha. I share the pivot with another farmer of which we are each allocated 10 ha. Currently I have planted yellow maize on contract and in winter I am planning to plant barley. I was just an ordinary farmer doing things the traditional way and without paying attention to minor things that could affect my farming. But since Grain SA came to Taung, it really motivated me a lot and also motivated me to pay attention to my farm as it brings food home. I was made aware that farming is a business and I need to treat it like a business. I was never aware that I should budget for my production and keep some money for the next season. It really helped me a lot to know how to weight things and to make the right choices in my farming. I can work independently if there is a need but I still work well in a team. I am a very patient person which gives me strength to hold on in difficult times and to have hope that things might change. I am an honest person and I also expect that from others, which is not always the case. If someone is not honest with me I get very angry and sometimes I feel I might overreact. I used to plant lucerne but eventually got interested in grain production. I started with barley production which yielded around 67,8 ton in winter and my first maize production yielded 82 tons. The barley that was just harvested in December 2015 yielded 55,6 tons. I am currently expecting around 90 tons of maize – that is if there is no serious climate effect. I spend most of my time in the field looking at livestock damage which is a common problem. I also like to ask a lot of questions on things that I do not know. In most cases when there is damage or something on the farm that I have never seen, I will call my co-ordinator to assist me. This way I am sure that things are going the right way. I made farming my life even though sometimes I do not have all the resources to do my own things. I managed to attend the following training course offered by Grain SA: Wheat Production, Barley Production, Farming for Profit, Tractor and Implement Maintenance, as well as Skills Development: Welding. These were really interesting short courses and I really enjoyed them. I feel I should still do the Pivot and Pump House Maintenance course. These courses are important to us because we farm under irrigation. I want to see myself far ahead with farming and if possible leasing some land to increase my production. 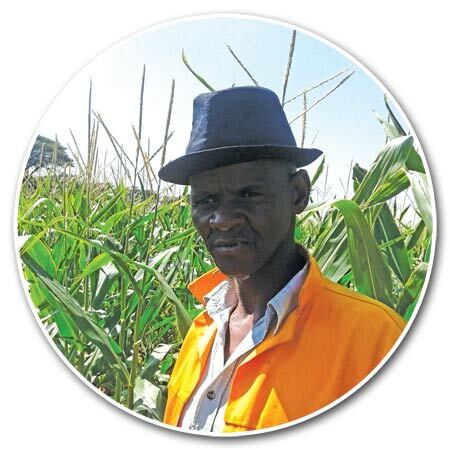 Grain production is important to me as I want to be the best small scale grain producer in Taung. In future I would also like to have my own mechanisation and to farm on my own. I would also like to move away from contracting – this way, I would have achieved quite a lot. Most young farmers give up too quickly because they are not patient enough. Farming is not something that you can just wake up and do and became a millionaire. It takes time and constant focus on what you like and what you do. Doing things the right way, you can go far with farming. Young farmers just have to be patient, do things correctly and listen to advice from their development co-ordinators. Grain SA Farmer Development Programme, North West.